To promote interdisciplinary learning and to keep up with the changing environment, IIT Bombay established its management school in 1995 with the objective of transforming professionals with technological background to "Renaissance Leaders" of tomorrow. In the year 2000, the school was renamed as Shailesh J Mehta School of Management, in honor of Dr. Shailesh J. Mehta, a distinguished alumnus of IIT Bombay and a generous contributor to the school. The School Of Management already leads the way in preparing its Graduates, who bring with them knowledge and experience in varied faculty of engineering to respond to the new challenges by drawing on the varied intellectual resources of IIT Bombay and providing an outstanding and innovative program in management education. Only first class graduate engineers or first class post- graduates in science are eligible to sit for the rigorous three-tier selection process: Common Admission Test (CAT), Group Discussion and Personal Interview. International candidates are selected through GMAT in lieu of the CAT. Every year around 2 lakh students appear for CAT and only top 1.5% of the students make it to SJMSOM after the rigorous Entrance test, group discussion and personal interview process. The pedagogy involves concept classes and case studies. Strong foundations are laid through the theory classes which help in understanding the underlying concepts and also critical appraisal of the theories. Illustrating the same with case studies, consultancy experiences and practical problems from the industry helps in cementing the concepts. The rich and diverse work experience of the students adds another dimension to the whole learning process. SJMSOM boasts of enviable student faculty ratio of 5:1 and students are also involved in the research projects taken up by the faculties along with the regular academic load. The Master of Management curriculum is structured as four semesters with two terms in each semester. A total of 156 credits are covered during the whole programme. Students undertake an 8 -10 weeks Summer Internship Programme in various business firms across various management functions at the end of the 1st year of the programme. Industry interaction is the round the year phenomena and with over 100 industry stalwarts visiting every year, SJMSOM Boasts of one of the best Industry interaction among the b schools in India. Following are the avenues through which the students interact with the industry. As a part of IIT System, we imbibe the value of student driven activities, which is an essential part of IIT culture. Student driven activities range from organizing events in Avenues, Annual Business School festival of the B school to conducting Placement process is with the assistance of professors and coordinating these activities provide the best environment for the students to learn management by practice. 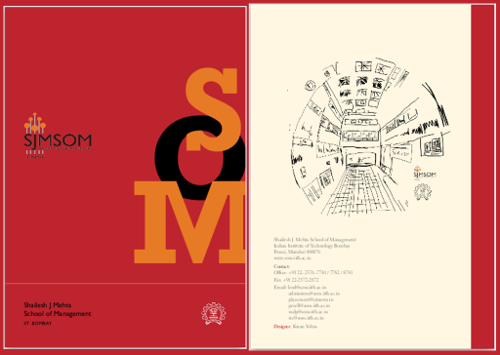 SJMSOM has a strong club culture with 5 clubs each focusing on a management stream like Consulting, Finance, Marketing, Operations and Systems. Through these clubs, like minded students come together and organize events round the year. * 5th in 'Internationally known Top b-schools in India' survey conducted by Eduniversal, where Deans from 1000 selected business schools vote for the result. See the news item. * 8th in 'Top Government BSchools in India' survey conducted by HT-Mint and CFore. See the news item. * 11th in the BusinessWorld "India's Best B-Schools 2010" survey . See the article here. * 12th in 'Top 50 b-schools in India' survey conducted by Outlook and Gfk Mode. See the news item. * 9th in CNBC TV18 "A of B Ranking" (The A list of B Schools in India) based on the data survey. Over the years, students at SJMSOM have been excelling in international and national events.